REVIEW - Angel Adventures - Use a Potion! Angel Adventures is a platformer and the latest release from Norwegian developers Ravn Studio, a developer that typically specialises in games that are targeted for children. You take on the role of two angels, Fagan and Finn, who whilst rushing to an Angel Academy class manage to crash land into a cloud that held musical instruments, causing the instruments to fall down to Earth. Despite their teacher telling them they are not allowed to head down to Earth, they defy him and venture down to start their adventure trying to recover these instruments. Although simple the game story is entertaining throughout, the developer’s target audience of children clearly coming through. Characters you meet are full of life, be it the Pirate Princess or the Hustling Seals, interactions with them are often entertaining and comical. 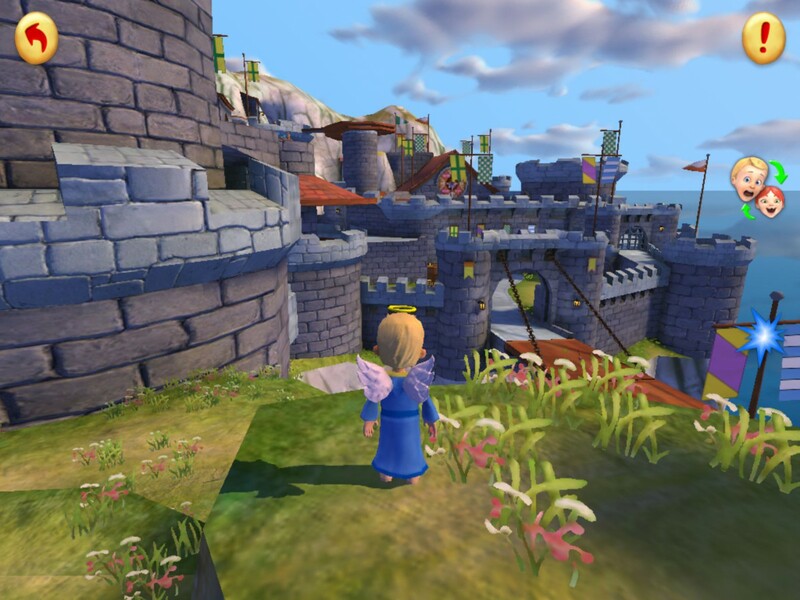 Upon starting the first level you will notice that Angel Adventures is a pretty game. 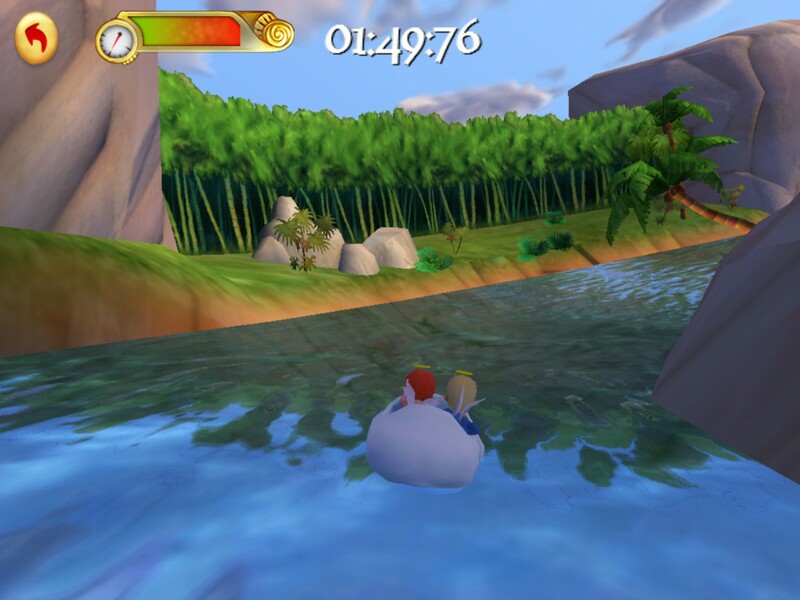 The game takes you across three different locations: Pirate Island, Winterland and Dragon Fortress. 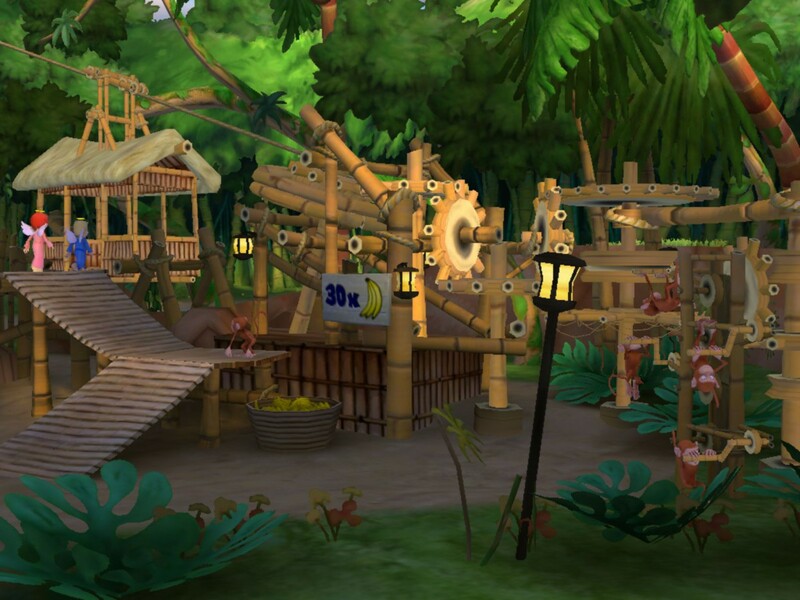 Reminiscent of platformers of yesteryear, each location is colourful and full of character – the environments packed with little details such as captivating flora and unique obstacles filling the area. Be it jumping from tree to tree or scaling dangerous cliff edges, Angel Adventures consistently looks attractive and keeps you engaged in the fantasy experience. The character models in the game don’t carry the same detail as some of the environments, but they do the job. Fagan and Finn are bland characters, but the enemies and NPCs are well designed and clearly crafted for their levels be it the ice demons in Winterland or the haunting ghosts in Dragon Fortress. However, there are some graphical errors that hold the game back. On a few occasions character shadows didn’t display correctly, appearing randomly across walls. In some cases I also found that NPCs would run through walls and disappear – this happened in one such case when I was tasked with catching a rat, a task made all the more difficult when the rat would run and disappear in the wall. There were also little details such as characters being able to run through treasure chests and then other times being held back by invisible walls against a ledge you should be able to jump down from. These are just minor gripes, but something that the developer could have ironed out with a little more polish. Gameplay is your standard platformer affair with precise jumps, simple puzzle solving and the occasional collectible required to progress. Unfortunately this is where Angel Adventures starts to falter. Controls are awkward on the touch screen, using one side of the screen to control movement and the other side to control character actions and the camera. However, you’ll find on occasions the controls can be completely erratic, causing you jump even if you pressed the attack button or sometimes simply not responding to you at all. Although this can partly be blamed on the awkwardness of a touch screen, you can’t help but be frustrated when your trying to make a precise jump only to find your character falling to it’s doom. There isn’t much diversity in the enemies, the only significant change being that they get bigger and take a few extra hits to defeat. Defeating them is a mundane task in itself, with no real way to dodge or block attacks you simply find yourself staying motionless and spamming attacks, hoping you defeat them before their constant projectiles defeat you. However, being defeated follows up with an immediate respawn in the same area as if nothing happened, deeming any repercussions of defeat redundant. It’s not all bad though. Levels are well designed, all areas within a level seamlessly and meaningfully connected with no loading times. One moment you may be dodging falling boulders within a mine, the next completing a knights obstacle course – levels are well crafted and there’s enough variety to keep you interested. The game also throws the occasional mini game at you including a ride on the back of a dragon shooting down targets and a gyro controlled escape down a volcano. These moments are enjoyable and break the gameplay up nicely. Hidden collectible cards can also be found in hidden areas in levels, each one unlocking you a piece of artwork – a nice little addition and something extra for you to work for. The music in the game is upbeat and pleasant, really adding to the ambience of the levels. Each track fits in well with its corresponding area, be it a more peaceful tune whilst adventuring across the calm beaches or a creepy tune whilst going through the graveyard. Sound effects are also well used across the game. Voice overs however are mediocre at best, some of the voice work sounding completely flat and uninspired. There are also moments in the game where the voice overs and cut scenes don’t match at all, leaving you still listening to a cutscene that had finished moments earlier. In one bizarre instance, one line that is delivered by Finn’s character seems to actually be voiced by Fagan’s voice actor, a peculiar oversight by the game’s developer. Angel Adventures certainly isn’t the worst platformer you are going to find on the App Store, but it’s far from the best. With it’s pretty graphics and good level design, it’s 3 to 4 hours run time is at times enjoyable – at other times however it is simply held back by frustrating controls and uninspired combat that can make the game a drag to play.